Ballet Ariel’s beautiful ballet Ballerinas by Degas epitomizes the grace and elegance of classical ballet. Ballet Ariel’s creative team has produced an original treasure, Ballerinas by Degas, telling the story of a young dancer, Simone, her rapid rise within the Paris Opera ballet company and the Impressionist artist, Degas, who records it all. Dappled with jealousies and rivalries, under the watchful eyes of their mothers, the young dancers vie for position at the barre, in the company and for the attention of wealthy gentlemen. As the audience experiences the backstage drama of a ballet company, they see the young ballerina Simone’s hard work and commitment quickly propel her from neophyte to etoile (lead dancer). 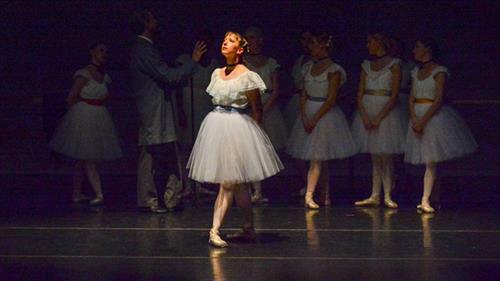 Performed to the music of Georges Bizet, Gabriel Faure and Adolphe Adam, three acclaimed composers of the day, Edgar Degas’ gorgeous paintings are recreated on the stage. Ballet Ariel was founded in 1998 by Artistic and Executive Director Ilena Norton. Celebrating its 20th anniversary season, Ballet Ariel has evolved into a laboratory for developing original classical ballets, a collaborative environment where the beauty of classical ballet comes together with narrative storytelling and a contemporary vision. This professional company is known for its graceful and elegant, yet dynamic, choreography and staging. Ballet Ariel also offers an exceptional pre-professional, classical ballet program and dance classes, giving young dancers an opportunity to reach for their dreams. Located in Denver, the company employs twelve professional dancers under Rehearsal Director Oleg Dedogryuk and Ballet Mistress Patricia Renzetti. Ballet Ariel’s repertoire features original ballets such as Ballerinas by Degas and Rikki-Tikki-Tavi along with classical works including The Nutcracker and Cinderella. Ballet Ariel performs its season concerts at the Lakewood Cultural Center and the Cleo Parker Robinson Theatre in Denver. They have also performed in the Arvada Center for the Arts SummerFest Series, in the Lone Tree Passport to Culture Series, as an artistic partner at the PACE Center, throughout Colorado and in Wyoming. Ballet Ariel receives funding from five Counties through the Scientific & Cultural Facilities District and Denver Ballet Guild. For more information, visit www.balletariel.org or call (303) 945-4388. Co-Sponsored by Platte Valley Bank, the Des & Carrie Bennion Family/The Bon Agency Insurance, and KCWY-13. Partial funding is from the Schneider and Cate Funds in the Wyoming Community Foundation-Casper, and Natrona School District No. 1.